After being absent for the past 2 months, I am back with the SSB bake. 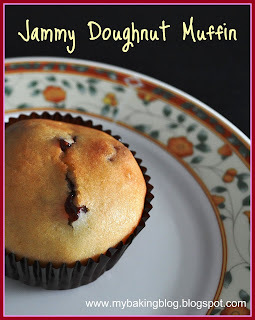 This month, we are baking Jammy Doughnut Muffins. I did not know what the word "doughnut" is doing in there initially, but after taking a bite, oh....I know! It does have a texture that is a little wee bit like doughnuts. The recipe calls for the mixing wet and dry ingredients together method, which I am quite afraid of...because although it sounds easy, it is even easier to overmix and get a tough muffin. Secondly, the jam has to be in between the mixture. I worry that it will result in undercooked muffins like my Lemon Curd Muffin. To overcome this, I fill the muffin tin 3/4 full of muffin mixture, add 1 tsp of jam, and then add 1 tbsp of muffin mixture over it (instead of 1/2 muffin-jam-half muffin again). I omitted the topping because I did not want the extra sugar and butter intake though I think it should taste better with it. wow, your muffins look delightful! These look great, love the way that you can just see the jam starting to explode through the top! Your muffins turned out wonderfully delish. Thanks for taking part and hope you will join us again. Check out Sweet and Simple Bakes tomorrow for this month's bake! welcome back! your muffin looks great! Your muffins look great without the topping. Mine were too dry to leave without it. They were pretty good cool but much better warmed. Yum! Save one for me pls! They look lovely. I brushed the muffins with butter and sprinkled with sugar, didn't need as much for the topping that way! Just remember don't over mix the wet and dry mth and you will be okay.